Often times in high school basketball when a father is coaching his son/daughter it causes a sticky situation. 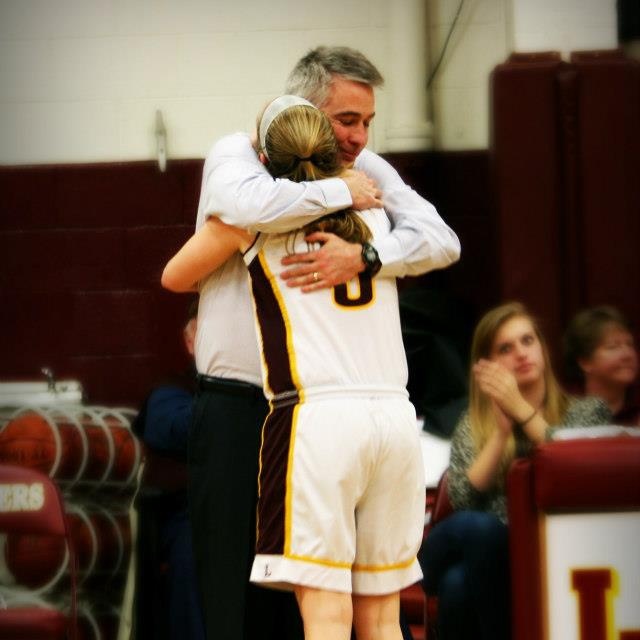 However in the case of Emily Kehoe being coached by her father Tim at Lebanon it couldn't have worked out any better. Their family grew closer than ever, Emily had an undefeated state championship season as a senior, and now she has committed to St. Joseph's College in Maine where she will continue her basketball career. "Ever since I can remember basketball has been part of our family" Emily Kehoe told the NH Notebook. "When my mom couldn't watch me I would go to practice with my dad. When I started playing for my school team, I looked less than promising. I had to work hard to get where I am today, and my Father was a big factor in that. I never gave up, and my dad never gave up on me. Being the coaches kid was hard, and some days I wished I wasn't, yet those are the days I don’t remember. I remember the days where me and my dad left practice smiling, and I will remember ending our father daughter / coach player relationship with our championship. The bond that basketball has given my family is incredible. Playing for my dad was an honor, and I couldn't imagined ending it any other way. He has made me the hard working player I am today." Tim Kehoe has coached the Lebanon girls basketball program for 20+ years. They have made it to at least the quarterfinals every year during his tenure and he has won 3 D-II state titles. However it is safe to say the four years he'll remember most are the last four and the championship he'll remember most was the one him and Emily won together in March. "It was hard but I think by her senior year we had finally figured it out" said Coach Kehoe. "Our drive home is about a half hour and we made a rule that we stopped talking about basketball when we hit I-91. That gave me about 5 minutes to vent. Em handled things very well. There were many times I would say things to her I would never say to other players. As she got older I grew up a little and learned to control that more. The thing about Emily is the fact that she works hard both in practice and in games - she has a great motor. Emily is one of those kids that if you play against her you will hate her, but if she is on your team you will love her. I don't think I have ever had a kid that plays defense and runs lanes harder then Em. She will run lanes 10 times in a row as hard as she can knowing she will not get the ball and on the 11th time if you let up she will beat you down the floor. She is a warrior! I will take 15 of those blue collar workers any day. She has improved so much. As a coach I am grateful and as a parent I am proud." If those two quotes don't give you the warm fuzzies I don't know what will! So now let's find out about Kehoe's recruitment, and how she decided on committing to St. Joseph's. "Around this time last year I went to visit about 9 schools" said Kehoe, who made was a first team all-state selection this past season by the D-II coaches. "I knew I wanted to play basketball so I narrowed my search to D-III schools in New England. After meeting with the coaches, and visiting with the schools I narrowed it down to three schools - Keene St, Castleton St. and St. Joe’s in Maine. During the season I had weekend visits with all three schools. I got to spend time with the teams, and got to know the players, so I got a good feel for the campuses. All three coaches were great. they came to my games throughout the year and didn't put a lot of pressure on me to decided until the season was over. After the season I went back to all three schools in a three day span. It made me realize why I liked St. Joe’s in the first place. The players on the team are so nice and they made me feel welcome. The way they hung out with each other reminds me of my Lebanon team. They are close and that is important to me. Coach McDevit is a great guy and seems to care just as much about how his players do off the court as on. I even met with the head of the education department who talked to me for over an hour about what she would do to help me be successful. I just have a great feel for St Joe’s it seems close knit and at the end of all this I just wanted to be a part of that atmosphere." The St. Joe's women's team went 16-11 in 2012-2013, advancing to the semi-finals of the GNAC (Great Northeast Athletic Conference) tournament. The year before that the Monks went 23-2. "I think Emily will fit in well at St, Joe’s" said Coach Kehoe. "They were looking for a hard nosed defensive guard and Emily Fits that to a tee. They are an up tempo team that is looking to press more next year so I think Emily will help More importantly is the fact that Emily, my wife Jen, and I all thought this was the best fit educationally and socially for her." While most players from NH who go on to play college basketball travel the country playing their AAU ball for a program like the Rivals, Crusaders, Shooting Stars or Flames, Kehoe took the road less traveled. She played AAU locally for the Lebanon Voltage, but still was able to accomplish her goal of playing college basketball. "I don’t regret playing for Lebanon Voltage one bit" said Kehoe, who is a 5-foot-7 combo-guard who plays the game extremely hard, can score in a variety of ways and is a tenacious defender. "It gave me a chance to play with my friend who I love playing with. Playing with Voltage only hurt my name recognition in the state, but that gave us more motivation to beat the higher name players. I always knew I wanted to play Division III basketball in college, so it wasn't as important that I travel really far. We played great competition in Mass and Connecticut. The Voltage also worked well so that I could do both track, and AAU. My Uncle Ed was our coach and he was a great one, we always had hard practices that also reminded me of why I fell in love with the sport. In the end I wouldn't change a thing. The relationships I have made with last a lifetime, and the experience I gained has brought me to the player I am today." There is no doubt that with Kehoe, Moriah Morton, Heather King, Samantha MacDonald, etc. all playing together on the same AAU team helped them win more games during the high school season. That culminated in Lebanon's perfect 22-0 championship season this winter, with Kehoe being a major factor in the title run. The Raiders won every regular season game by 23 points or more, then in the Final Four they beat Milford and Portsmouth in hard fought battles. Those games were closer, but Lebanon still never trailed in the 2nd half of either. That is a very impressive feat. "Winning a state championship this year was so fulfilling not only because we have been close the last three years, lets face it that happens to a lot of teams, but because of the team we had this year. I am so proud of the everyone on this team. It was all about 'us'. No one cared how we won just that we won. In order to do it people really had to step up. Vanessa improved in the post, Heather became a force this year, Jennie and Claudia came off our bench and gave us great minutes, Sam Made everyone look good by doing all the little things, and Moriah in my opinion is the best player in the division. Along with the rest of our bench who worked hard everyday in practice and improved a ton. I think the only pressure that I felt this year was that it was my last chance to win with my dad. We have both worked so hard for so long, and this was our last chance to win for each other. To win this year with the team I had and ending me and my Dad's run together, it was a great way to end my high school career." The St. Joe's women's basketball program is a consistent winner, and they are adding a player who has won games consistently ever since she was in 4th grade. Congratulations to Emily Kehoe, and best of luck to her in the future.